A book that I always feel compelled to refer to as “Jonathan Bardon’s magisterial History of Ulster”. This is not, it must be stressed, a history of Northern Ireland. Its scope is much larger than that, and it begins in the mists of pre-history, with what little we know of the first people to settle the area that much, much later came to be called “Ulster” (and who were, you’ll learn from this book, very probably the very first inhabitants of the whole island). The updated edition thus stretches from around 7000 B.C. to 2000. Whenever I recommend this book to students they are always visibly put off by its size. It’s BIG. (I remember once sitting on the tram reading it. There were two young boys, aged maybe 10 or 12, opposite me. “That’s a big book!” said one to his friend. “Yeah,” replied the other. “It’s even bigger than the latest Harry Potter!”) But in fact, it’s extremely easy to read. Each section begins with an overview that summarizes a whole period, and chapters are divided into many short sections, usually only a couple of pages long, so you really feel you’re zipping through it. R.F. 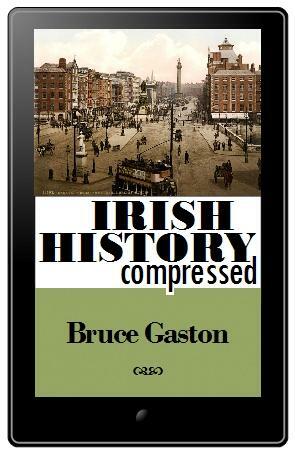 (Roy) Foster wrote a comprehensive Modern Ireland 1600–1972 and this smaller volume can be considered a kind of pendant to it. It began as a series of lectures and thus shouldn’t be considered a full overview of the period. But what a period! Incredible economic growth, social change and reaction, secularisation, scandals, the dumping of shibboleths such as the constitutional ban on divorce, all against the background of sectarian violence and terrorism in the North. Foster picks out those topics that interest him most: secularisation, feminism, the fortunes of Fianna Fáil, the changing attitudes of the Republic to Northern Ireland and its nationalists, and the (often unreal) image of Ireland, especially as it is presented abroad through popular music, literature, and the efforts of the tourism industry. His treatment of them is incisive and often witty. He has a gift for choosing a vivid fact or quotation to illustrate a point. Would you believe that in the nineties Fianna Fáil politicians hid dodgy donations and kickbacks in “tax-haven companies with names like ‘Caviar Limited’” (p. 94)? Or that Enya’s music, so beloved of airlines worldwide, also “provided the soundtrack for the most frequently televised replay of the World Trade Center’s apocalyptic detonation” (p. 154)? His dissection of the uses and abuses of ‘Celticism’ (such as the ubiquitous ‘Irish pub’) is highly entertaining. Nor is he afraid to praise or criticise when he think it fitting. For example, the wanton vandalism to city and countryside that was often justified as the price of economic progress is rightly held up for censure. A.T.Q. Stewart, who died three years ago aged 81, was a distinguished historian from Northern Ireland. He wrote on many topics, such as the period of the anti-Home Rule movement and the history of the United Irishmen, in which he was particularly interested in the role of northern Presbyterians. The book’s title alludes to Stewart’s search for patterns in Ireland’s history, such as recurring constellations of similar situations, cultures, personalities, opinions… It’s a phenomenon Foster also notes at times, such as when he compares the attitude to the Irish language in the Free State of the 1920s to that in post-Agreement Northern Ireland. Stewart’s book ranges further in geographical terms than Bardon’s A History of Ulster but over as wide a stretch of time. At the start, Stewart criticises the neglect of prehistory in Irish historiography — why, he asks, has this subject been left to the archaeologists? One of the tasks he sets himself in the book is to cast some light on less well known areas of Irish history. You will, of course, have heard of the Famine. Even people who know nothing about the history of Ireland have heard of it. But were you aware that the events of 1845–49 were just one instance of famine? The great famine of 1741, for example, killed a third of the population — in proportional terms more than the Great Hunger a century later. Yet it’s the latter that is always commemorated and memorialised. If you’re wondering why, then read the book. This would be my recommendation if I had to choose one book to read on the Northern Irish peace process. Terry Eagleton is the Manchester-born son of working-class Irish parents, who made a name for himself by introducing modern literary criticism to the genteel lecture halls of Oxford University back in the sixties. He’s a prolific author and celebrity don, known for being a Marxist and iconoclast. The Constance Markievicz of whom I am speaking ill had nothing peaceable about her. She was a self-indulgent bloodthirsty show-off who brainwashed children into believing they must die for Ireland, who killed without pity and who — defying the vote of the Irish people in June 1922 to accept the Treaty — continued to murder during the civil war. Craving excitement and the limelight, she adopted causes she barely understood because she was mesmerised by charismatic male leaders. Although she gave up a life of material comfort when she espoused revolution, Markievicz was a snob with a bogus title. Physically brave to the point of recklessness, she lacked the moral courage to admit her failure of nerve when faced with the prospect of execution. Beautiful and flamboyant, Constance Markievicz was all style and no substance. So there you have it: not a top ten, but a top five and a half (taking Eagleton’s book as the half, since it’s only partly about history). I had a pleasurable time rereading them in order to compile this list. You could do worse than putting a couple of them on your Christmas list.